I wanted to force this post into the Nonfiction Monday category, but it won’t quite fit. 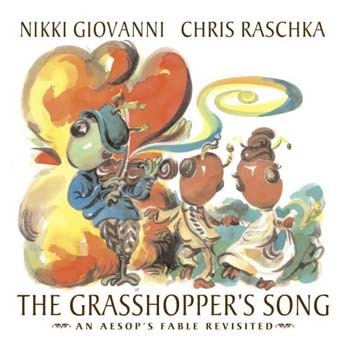 This is Nikki Giovanni’s and Chris Raschka’s brand-new adaptation of Aesop’s “The Ant and the Grasshopper,” and—to be sure—those fables of Aesop are lumped into the 398.2s. But, not only does this not qualify, I think, for the “facts first” mission of Nonfiction Monday, but Giovanni has also really elaborated on this tale, adding a new cast of characters (literally — the book opens with a spread which depicts our “cast”) and turning it into an argument for the respect for and compensation of an artist for his/her work. I speak of The Grasshopper’s Song: An Aesop’s Fable Revisited, illustrated by Raschka, and published in May by Candlewick. But things aren’t so black and white, as it turns out. Henry Sr. is reluctant to take the case: “You provided a service they didn’t request.” Indeed, a contract for services was never provided or signed. Jimmy’s reply? “But they used it. They accepted my offer by letting me work alongside them every day.” Henry Sr. and his partners decide to take a stand, to take the case. Jimmy Grasshopper will sue for respect. Am I not worthy of my bread? Does not the work of my heart and soul earn respect? I am an artist. Is there no place for beauty, no solace for the ear, no hope for the heart? Must everything be in the marketplace? Doesn’t the marketplace itself need and deserve beautification? Artists tell the stories that entertain and instruct; we tell the jokes that make you laugh, thereby keeping you happy and healthy; we describe the beauty of nature in ways that can make you weep with awe at the marvels of a Higher Power. Without art, life would be a big mistake. It is art that speaks to a higher good in us; it is art that reminds us our immortal souls should seek a higher purpose; it is art that gives us not only the words for love but also the reason for it. Are you thinking what I’m thinking? Not exactly picture book fare for the wee’est of children. Sure, read it to ’em, but the text is lengthy and the themes heavy and philosophical. These crunchy, thought-provokers might fly over the heads of the wee. 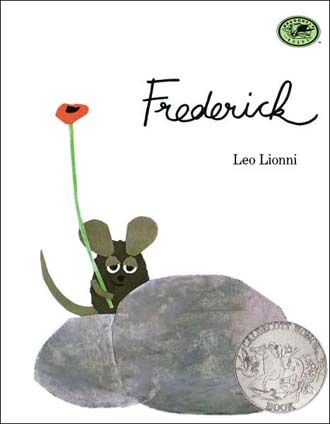 Read them Lionni’s Frederick instead, by all means, as a prelude. I’m a hugely huge fan of Raschka. He does not disappoint in this title. He even rather wows with his earth-hued tones (but with sufficient splashes of lovely color — the “snowy, icy winter . . . underground buzz” spread with its pinks is a study in perfection) and mesmerizing lines, swirly movements, anthropomorphized forest creatures, all rendered in impressionistic watercolors. I do think that one character tends to blend into another so easily that one must really take their time with this title. Perhaps Raschka intended this; I certainly lingered over each page longer than normal. And the endpages? Breathtaking. Can we see more Raschka-flowers in future books? Please. Ah, this book addresses the very things I’ve been thinking about. I’ve asked a number of times, “Why isn’t there just one (or two) places online where you can easily find the song you want to use/perform, submit an application to use it, and know upfront just what fees you’re expected to pay? When you want to perform someone’s story and the story is out of print AND the author is dead but the story is still in copyright, why is it so hard to track down the person who owns the copyright?” And on it goes. I put this one on order a week or so ago and am anxious to see it. Alkelda, If most people tried to stand in front of a group of children at a festival or birthday party or event and attempt to entertain them, they’d understand about your training mighty quick. Most of them don’t try it, though, on account of being terrified. This book sounds like a hoot. I can definitely see it for the 7-9 year old group who is all about fairness. Kids that age already argue so eloquently; what fun to give them something else to think about. Alkelda, I kind of love the idea of a storytelling hotline. We could all go in on it, manning the phone in shifts, kinda like the Babysitters’ Club. Jules, do you think Giovanni and Raschka are trying to squelch the next generation of music-downloaders? It would be interesting, indeed, to hear their thoughts on music-downloading, eisha. But, as Alkelda pointed out recently, when she gets, say, a mix, she ends up buying a lot of the CDs from the musicians on said mix. But that is a whole other thorny, complicated topic…or is it? I do think this is a thought-provoking title for teens if they’ll only allow themselves to pick up what is labelled a picture book. Maybe I’ll go post about it on Guys Lit Wire, too. Interesting but/and familiar, too. Has anyone seen Who’s Got Game? : The Ant or the Grasshopper?, by Toni Morrison/Pascal Lemaitre? Similar ideas here? Brian, nope, I have not seen that one, but I think I stumbled across the title…definitely interested in seeing it.